APS/Army Public School, RK Puram 39 Teachers Recruitment 2018, Last date: 31.01.2018, RK Puram APS teacher (PGT/TGT/PRT) posts recruitment application form, How to apply, last date for apply, selection method, online exam date, admit cards, results and more details @ www.apsrkpuram.edu.in. 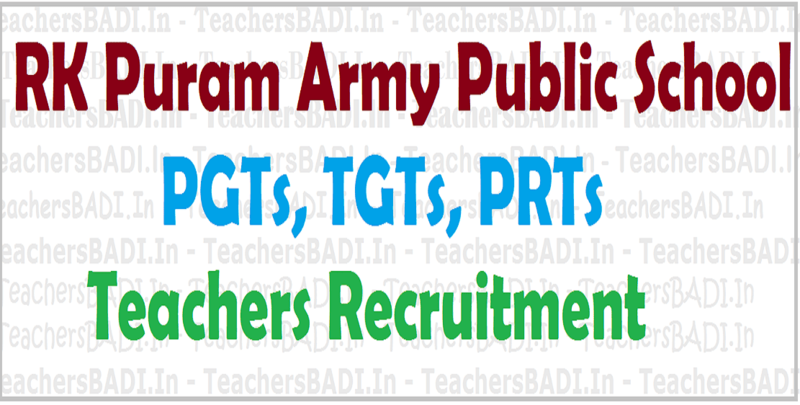 RK Puram, Army Public Schools (APS), Secunderabad has given teachers recruitment 2018 notification and APS RK Puram invites application forms for the recruitment of Teacher vacancies. These schools are administered and managed by local Army authorities and affiliated to CBSE through Army Welfare Education Society (AWES). a) PGTs: Must be Post Graduate with B Ed with minimum 50% marks in each. Other qualifications and experience as per CBSE Affiliation Bye Laws (Chapter IX). b) TGT & PRT: Graduation with B Ed and equivalent with minimum 50% marks in each. Other qualifications and experience as per CBSE Affiliation Bye Laws (Chapter IX). Candidates who have cleared CTET/TET Exam will be given preference. (i) Fresh candidates - Below 40 years. Candidates who have qualified in the Combined Screening Board (CSB) exam and Score Card holders may apply for the interview. Candidates who have not qualified in the screening exam will not be considered for CSB Interview.